Renowned cardiac surgeon ​Dr. Devi Shetty​ asks Sadhguru about the significance of human touch in diagnosis and treatment. Sadhguru explains that touch is very significant, and it not need just be physical touch. He speaks of the importance of being touched by life and being absolutely involved with life. Devi Shetty: (Laughs) Today the medical science has reached a level Sadhguru, we really do not have to touch the patient. When I see a patient in my office, he would have undergone all kinds of tests, everything is done, all the images are displayed, history is written, everything is planned. Technically, I can see the reports and tell the patient “Okay you need a bypass or you need valve replacement.” But, I always make it a point to take my stethoscope, put it on the chest, listen to the heart, look at the patient (patient’s?) eyes, put my hand around on his shoulders, touch the patient and then explain to them what is going on and talk to the family. I personally feel that touch is the… has the most healing power, than anything else what we have invented (Applause). Do you believe in that Swamiji? 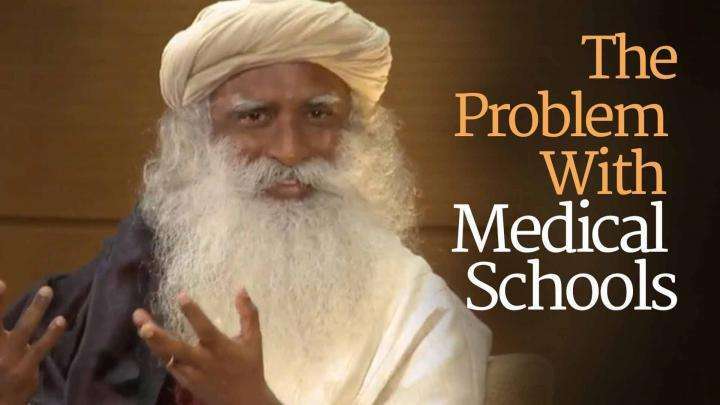 Sadhguru: Yes, in the sense what the young doctors may not know is, they are working themselves to extinction. Tomorrow somebody will come up with a new software, which will read all these tests and come out with a diagnosis by itself (Few laugh) that… they are just working towards their own extinction. Sadhghuru: You won't need a doctor. Sadhguru: …can carry and… you know. You can load the whole medical textbooks into it, re… seeing all these tests. Devi Shetty: Without any problems, yes. Sadhguru: Yes, no touch. See, what is not understood is - yes one part of us is mechanical, but there are other dimensions. Most of the time the mechanical part has gone wrong because we have not tended to the other dimensions. Today there is substantial studies talking about, you know there is… there are studies where, monkeys (Few Laugh)… one monkey is living with a… two monkeys are living together as a couple. One is in isolation and this monkey develops heart problems, plaque in all the arteries and you know this kind of stuff, both for rats and monkeys they have done. You didn’t have to waste these monkeys’ life, whole lot of human beings are going through (Devi Shetty Laughs) that on an every… everyday basis. So what is lacking in their life is, their life is not touched - not necessarily… a physical touch is just a manifestation, essentially their life is not touched by anything. When I say touched by anything, it need not necessarily be a relationship, you can be touched by so many things. I don't know how many of you… when was the last… how many decades ago did you watch a sunrise (Laughter) or a sunset or a moonrise? I am saying not touched by anything. When was it the last time you waited for a flower to bloom? No such thing. When is the last time you paid an attention to a butterfly or a leaf or a flower or another human being? You’re… (Laughter) You don’t like faces, you like the Facebook. (Laughter) I am saying contact with life whether it's human, animal, plant-life or just elements around you, just that - how many people even take a moment to even look at the food that they’re going to consume with a little bit of involvement or are they touched by it? No. So al… at last either a doctor has to touch it or in the end undertaker will touch you. (Laughter) Somebody will touch you, things gone bad, somebody has to touch you. So does touch have a relevance? Tremendous relevance. Touch need not always be physical, it can be in so many different ways. If you’re not touched by life - you are a dying life, you are not a living life. It may happen to you after some time but it's happening, you are in progression. Because what you call as life even in the physical level - it's a…it’s medical knowledge for everybody now - the number of cells you have is more than the number of stars in the Milky Way, okay? Every day over six hundred million-billion cells are dying and new cells are being born, that means every second ten million cells are dying and ten million new cells are born in your body. If you just take… leave the old one…old guys, if you just take charge of these new ten million cells every… every second that’s coming up in your body, if you structure them properly, create them properly, if you have some say in how they will happen, if you have some influence as to how these fresh cells are born, your heart should be fixed, your brain should be fixed, everything should be fixed because that is the level of opportunity you have to rejuvenate your life second to second. But because you are totally oblivious to life - when I say oblivious to life, I want you to look at this - right now you cannot even call yourself as a living being, because most of the time what is happening with you is just thought and emotion. Thought and emotion is just psychological drama, it has no existential relevance. Here a thousand people can sit here and live in thousand different worlds right now, that means nobody is in reality. Nobody is living, everybody is thinking about life. Psychological space, what happens, has unfortunately overtaken the existential process of life. You do not experience life, you’re only thinking and reacting to situations around you. Thought and emotion is dominating everything. So, right now today morning sun came up on time - you don’t think much about that “Okay so what?” (Laughter) No, you need to understand, if sun does not come up tomorrow morning, within eighteen hours all life on this planet will largely seize as we know it. So I am telling you sun came up on time today morning. I want to hear appropriate noises (Applause) (Devi Shetty Laughs). None of the planets in this solar system collided today (Laughter/Applause). In the whole universe no accidents, in this endless cosmos no accidents, everything going great but you have one nasty little thought crawling in your head and it's a bad day (Laughter). I am saying you’ve completely lost perceptive with life. You lost perceptive as to who you are. It's a kind of madness. So once you lose perceptive as to who you are and what is your sp… what is your space and status in this existan… existence, you are a sickness by nature. It is not doctor has to diagnose you, it's already on. One day it will manifest to a point where his instruments or his touch will tell him but it's already on. The process is on. When it goes beyond a point, he will give you a prescription or a surgery but the process is on, you are working hard towards it (Few Laugh). 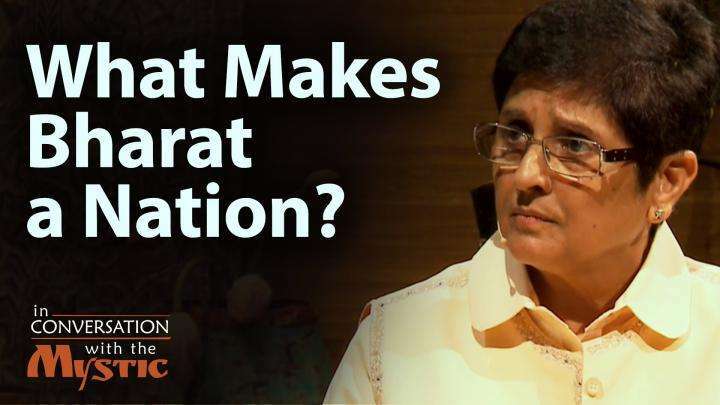 Kiran Bedi engages Sadhguru on the issue of what holds Bharat together as a nation, despite being ethnically and culturally so diverse. 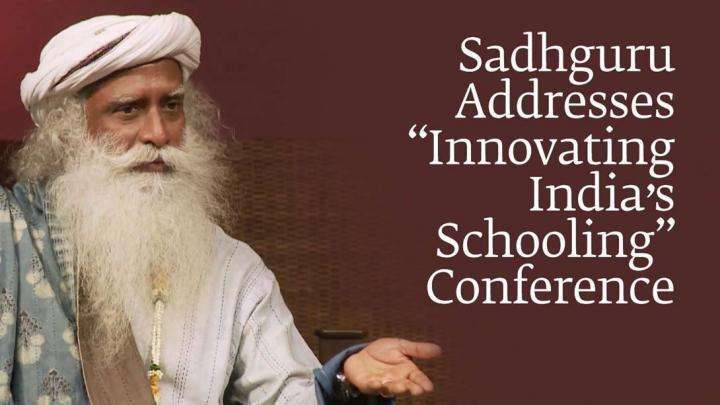 At the first annual “Innovating India’s Schooling” conference, Sadhguru shares his vision of reinventing education in India.